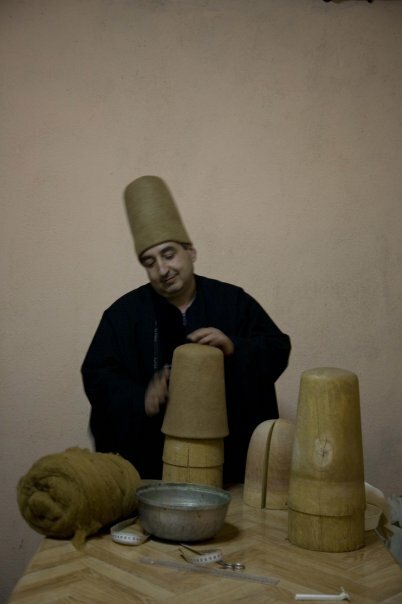 Today I wanted to tell how the journey of sikke(hat of mawlavi dervishes) and the journey of dervish is similar. I experienced it when I started to make them as a hobby. While I'm talking about the adventure of wool and man, I will mention Osho as well. Let me first talk about sikke and, of course, felt. The material of sikke is wool. In Arabic "suf" means wool. Everyone knows that the word "sufi" comes from this word, because dervishes used to wear woolen clothes. Wool goes through some processes to become felt, and then some to become sikke. Before, felt was used mostly as carpets or as a cloth (kepenek) for shepherds, when they were on mountains. So why did shepherds on mountains and open fields wear clothes made of felt? Because felt is actually pressed wool, and venemous animals like snakes and scorpions can't walk on it or get close to it. Shepherds would enter this kepenek with all their bodies and could sleep there safely. First you get the wool. It has to be from lamb. You can’t make felt or sikke from the wool of an adult sheep. This is the childhood of the man. As Osho mentions often the words of Jesus: "Only children will enter my father's kingdom." First material is the wool of lamb or sheep's baby, so the child. Wool is like a child. Soft, warm, thin fibered and can be shaped easily. The best wool to be sikke is the wool which was trimmed when the lamb is 7-8 months old. However, in this 7-8 months of time, lamb has already met the world, and the wool became dirty, has lots of trash and thorns on it. Yet when it was born, the wool was clean and shiny. Wool and man starts the journey of becoming sikke and an enlightened being (insanı kamil) from this same point. First wool needs to be washed and purified. On the riversides, you have probably seen some women hitting the wool with a stick named "tokuç" to wash them. The human being is beaten thousand times through life, like the wool by tokuç. "See how leather suffers in the tannery." says Rumi. Leather is tortured, tamed with various chemicals and treated with alum. He says: "The purpose of this procedure is because this leather is going to cover a beauty's body." After the leather goes through this procedures, It will meet the beauty that most people won't get close to, and embrace her, and hug her. Tokuç, wool and human. Every tokuç that hits us in life; actually hits our ego that says "I know", "I will do", "I have the power". Each hit and failure directs us to nothingness and giving the power back to the real owner of it. Just like a captain whose ship is crashed in the storm. Captain wants to repair the ship at the dock and sail again to open seas, but the sea(God) says: "Come and let me sink you again." This repeats again and again. Till the captain dies and merges with the sea. Than the Sea embraces him and the power is of Sea's. Rumi had never recommended his dervishes methods like isolation, torturing body or secluded retreat. Because it would be like drill a hole to his/her already sinking ship. The first washing of the wool is the difference(awareness) point: to realize that he is dirty, or as Osho says; he has trash on him. In Islamic mysticism (tasavvuf) there is a phrase: "Realize (be aware of) the difference." Because change starts from the difference point. The one who asks, finds the answer. Okay then... After this difference point the wool or the person needs a master (enlightened master). The master is going to re-shape him, re-create him, and show him the shortest way from his experiences. Master is an artist. He is a poet, a composer or a sculptor. He can walk on snow without living a mark on it. He is the one who found a way of it, and he is the one who knows the path. After master washes the wool, he lays it on a mold made of reed. He rolls it tightly and ties it roughly. This rope is like a belt of faith which appears in most of the religions and teaching. Then the master kicks the mold with his feet which is called "tepme". Rumi starts to Masnawi with : "listen from the reed." Also Osho tells his followers to be hollow like a reed. A hollow reed... A reed or a bamboo. For a while the wool starts a conversation with the reed , and tries to learn its secret. Of course meanwhile the master is kicking and squashing it. Master tells it by this method: "Forget all you know, surrender to me completely, and listen to the reed telling its secrets." Actually the final objective is the master. But when a person meets an enlightened one he examines the master with his already filled mind. So the masters always starts giving their teaching by other things. Till the love for the master starts to flower in apprentice. Because of this, Rumi doesn't start Maslawi with "listen from me" but "listen from reed". The fellow then understands the reed is Pir (Master, Rumi). Whatever... The wool converse with reed in this roll. Its actually like a seed thrown to the soil (reed). Rumi says: "When the seed falls on the earth, it starts to have a conversation with soil. Earth becomes the master of the seed. It teaches the seed how to grow. The seed is the apprentice of earth. It listens it, does what it says. The seed first gives up of its colour then its scent. Then leaves its shape and existence and turns its face to sun, becomes alive." Earth has whispered something about "the beloved" so that a dead became alive. Each grain, each seed is in love with earth. Beloved ones of all children in wombs are their mothers. Their mothers are their lovers and gods. There is a story about mothers being gods in sufi tradition but its a long one, so I will tell it later. Let's return to the wool. The wool starts its first whirling in this roll, which is "sema". It meets with sema. Because the master is rolling it while beating it. Whirling (sema) happens with joy. What Osho says: bless and dance... Meanwhile the wool which was laid down thin, has become thinner, stuck itself much more, and started to change its shape. Beating the felt needs a lot of effort. Each time master hits the felt with his foot he exhales, and with the rhythm of the kick he makes the sound "hu". He needs to maximize his breath in this hard work so he keeps saying "hu" in each beat, thus makes the work effective and constant. The master already does Dhikr every time. This loud "hu" sound is just to remind the call of beloved to the felt (human), saying "come back to me". Hu.. Hu.. Hu.. Remember Hu and return to your origin. This process keeps on going till the wool comes to a specific density/temper. Even though the master does not see the wool in the roll with his bare eyes, he can understand if the wool has gained to the right density by the force of his kicks and as the roll becomes thinner. At first master pours the warm water onto the wool drop by drop. He applies soap on it according to the amount of water, and then starts to press the wool with his hands again. He uses water and soap as much as the wool needs. Warm water symbolizes love. Heart of the wool is bubbled over while it is mold with love, just as the soap foams. As love (warm water) arises, foaming (soap) increases. Master unfolds the wool with each molding, and if it needs he adds more water and soap. In this stage, there is no place for mistakes. Master is very careful. If there are any holes or tears on it, he fixes them in an elegant way. In this procedure the temperature of the room (environment) is very important. If the atelier is cold it takes more time. The warmer the atolier, the quicker the procedure. In old times felt masters used to do this in public baths in specific areas. They used to work , sweat , and take a shower in baths. To me the environment of baths seems like the dergahs. Dervishes used to be raised in the warm and adoring ambient of dergahs. The mystic medium of dergah had helped them to mature. While felt is ripened it shrinks. It gets smaller and smaller in size (existence) as it ripens. As it shrinks it gets tougher and stronger. As I mentioned above venemous animals such as scorpions and snakes (which can hurt everything but god, or harms its very present moment) cannot come close to it. There is one last step for felt to become sikke. Sikke is formed by the convergence of two pieces. This two pieces are not separate. 2 pieces are merged together, so they are united as one and also as a pair. Sikke is a pair which seems one. Dervish hides every pair (good-bad, beautiful-ugly..) under the cover of unity (vahdet). He is a pair to whom sees him as pair, and one to whom sees him one. This principle is not something that he just has an idea of, but a way he shapes his life. To him abundance and unity is merged just like sikke is merged. Sikke symbolizes this unity for mawlawies. There are people who see sikke as the gravestone of dervish. And also nowadays mawlawies wear sikke in their houses for a while to remind themselves that they are following Rumi, and they see it as a symbol of his discipline. Let’s get back to the master and continue to the adventure of wool. Master puts these two pieces into each other. Then puts it into the mould which is going to give the shape of sikke to it. These words such as mould, shape, model may not be so appropriate for some people (specially for Osho’s teaching). But one should not forget that everything in the universe is in a perfect and aesthetic shape. Even things that appear us abstracts. Our soul is in the mould of body. The mould that mind and thoughts form is brain. Master puts the felt which is going to be a sikke in to the mould. From now on there is no harsh and tough techniques as kicks for the felt. To make the felt come to the shape of sikke, master fondles it gently as he is congratulating it. This procedure takes 10-15 minutes, and the wet felt is left to dry on the mould. Now sikke is ready for to be a gift to the followers and dervishes of Rumi as a sign of the way of love, to be a crown on head. Just like Rumi said: “Stone there is, that is beneath the feet which is cobblestone; stone there is that decorates the crown of sultan which is ruby/diamond.”, sikke is now like the crown of sultan. Lucky the ones who wears this crown, joins the caravan of Pir (Rumi) and becomes a fellow of him. Dear friends, today I tried to tell you the story about how the journey of the felt and human intersects. God shows a way for the ones who are aware, who have eyes to see and who have comprehension to understand. Masters of felt craft is now almost extinct and the craft is turned to an art by Westerns. We are losing one of our value because of our laziness, and our neglect to beauty, art and artists. Just like we are about to lose the great master of Islamic mysticism for the sake of imitation. If this neglect goes on, we will have to learn these masters and their teachings from the westerns one day... It appears to me that we don’t understand fine arts and artists (masters), and we are not trying our best to do so.